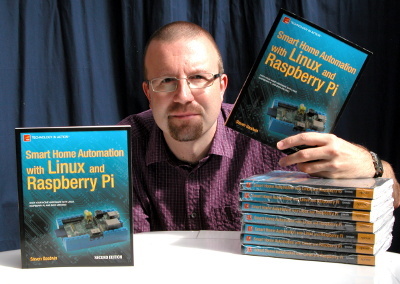 "Smart Home Automation with Linux and Raspberry Pi", the new book from Steven Goodwin, has just been released! 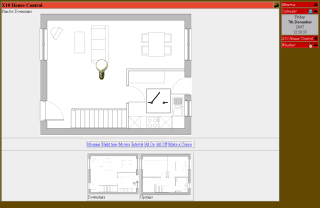 Minerva is a complete, easy to use, home automation suite. Using Minerva you can make your home easier and cheaper to run and more secure. With Minerva you can: switch on your lights from anywhere, using a mobile phone or PC; email your video; check your security CCTV footage; control your central heating and much more. Minerva runs on GNU/Linux, but exists in its own mini eco-system, with its own list of users, set of scripts, and functionality. It relies on command line tools to perform all of its many tasks, and can therefore be run from virtually any platform (smartphone, PDA, laptop or remote PC) with identical functionality. Minerva's visionary grand design is to provide a means whereby every piece of home technology can be interfaced together through a common technology - and that technology is Minerva! Through it's adoption of Open standards, and code released through the GPL, Minerva provides a platform that can encompass every user and system without vendor lock-in. The architecture consists of three parts, input, output, and process. Each is completely distinct, meaning you can control any of the house processes from any supported input conduit such as the web browser, remote control, or SMS text message. Similarly, any reports or notifications can be sent to any of the available output conduits, which may (or may not) be the same as the input. One common example is to trigger a process (such as switching the kettle on) using the remote control input conduit, but receive confirmation through the voice output conduit (where the computer speaks to you). These refers to any piece of technology inside the computer, or attached to it, that "does something". 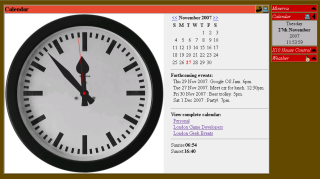 For example, an MP3 player, X10 interface, calendar, or CD player. Most processes are available through the Minerva web interface, so see the full list of Minerva Applets for details. This is the most commonly used input conduit. Also in existence, but awaiting formal release, is the SMS phone conduit and official LIRC conduit. Minerva supports speech synthesis (through Festival) as one of its output conduits, along with control logging, X10 output, and the ubiqutious web browser. Other conduits will become available in due course. Check out the Minerva features list to see what's currently supported. Or, just head right over to the Minerva Downloads page.